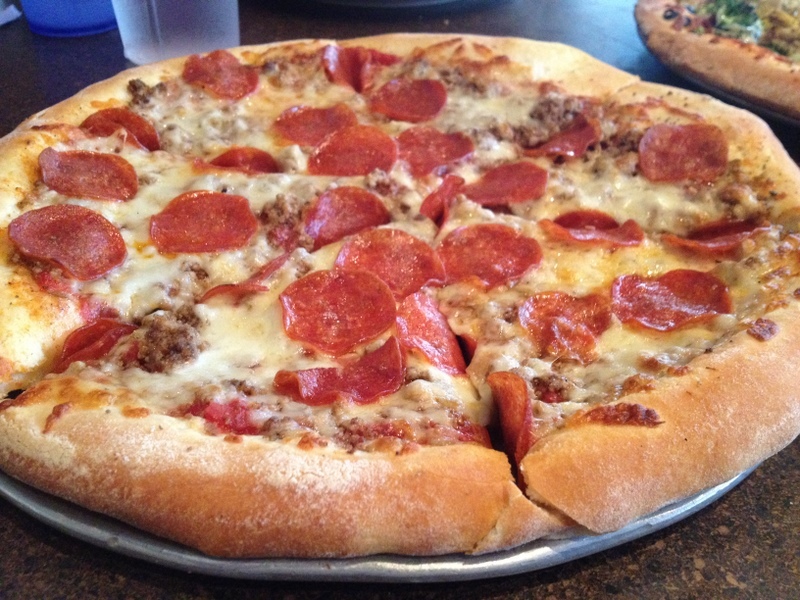 Since 1985, Zio’s Pizzeria has been making hand stretched New York style pizza in Omaha. 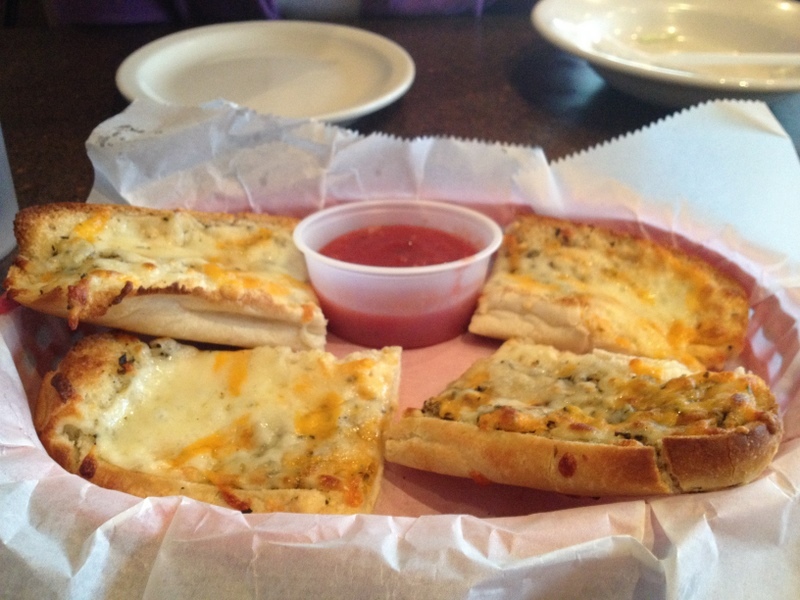 Zio’s is a well known name around these parts having won numerous awards for their pies. They now have three restaurants in town and tonight we decided to visit the West Omaha location on West Center Road. Even though the weather was nice, we opted to dine inside rather than sitting outside in their small patio dining area. After dodging a toddler sitting on the TV that’s recessed into the floor, we found ourselves a table and decided on a salad, 3 cheese garlic bread, a veggie pizza, a sausage and pepperoni pizza, a beer and a soda. We noticed that the self serve soda fountain had a load of drink options. Many more than most of the other pizza places we’ve been to, so you’re sure to find one to your liking. One quick comment about the TV in the floor. It’s right in the middle of the main traffic area of the restaurant and attracts the kiddos. Pretty bad location if you ask us as it would be pretty easy to trample one of those little suckers while carrying out your pizzas. The salad arrived quickly followed soon after by the three cheese garlic bread with a container of marinara for dipping. The cheese bread was good, pretty average for garlic cheese bread. The Pizza Wife commented that it wasn’t nearly as good as the cheese bread at Bernie’s Pizza Parlor which was sliced quite thick and loaded with cheese. The sauce was sweet and flavorful, with no real hint of any heat. Our pizzas arrived served on silver pizza trays. Both were piping hot and looked really tasty. 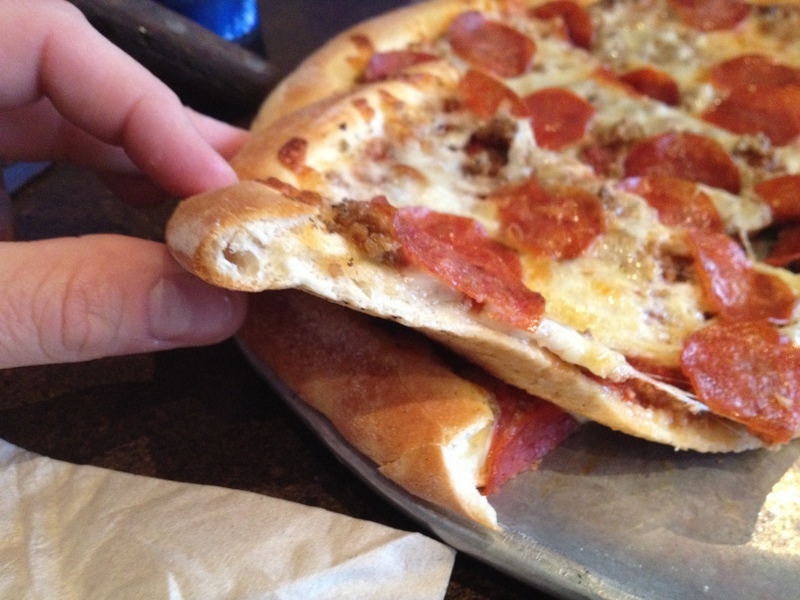 The crusts here are just what you’d expect for a place that touts New York style pizza. The crust is thin in the center and turns into a thick outer edge that folds perfectly and is terrifically chewy. From the pattern on the bottom of the pizza, you can tell that Zio’s cooks their pies on a pizza screen. Although you can’t see the ovens, their website says they cook using “old world ovens”, which I’ll assume to be your standard deck oven. I can’t imagine cooking true New York pizza in any other way. The Pizza Wife ordered the Veggie Supremo and it was piled with toppings. The typical mushrooms (fresh! ), onions, green pepper, and black olives were accompanied by sauteed spinach, artichoke hearts, and broccoli (which we didn’t ask for but was included anyway). Unfortunately due to the abundance of vegetables on the pie, the inner crust turned soggy quite fast. Such is life when ordering a veggie pie, but the Wife commented that it hasn’t happened with every veggie pizza she’s ordered since the tour commenced. Besides all of the water in the vegetables, we wonder what the type of crust has to do with the sogginess factor. Speaking of crust, the Pizza Wife would have liked a bit more crunch and crispness to her pie. It was a bit too chewy for her liking. The sausage and pepperoni pizza was very tasty indeed. As a fan of New York style pizza, Zio’s is right up there in quality in my opinion. The fresh sausage had just a slight amount of heat to it, the pepperoni was your standard pepperoni and was also good. Cheese covered the sausage and was then covered by the pepperoni. Again, New York style pizza is certainly my favorite pizza so it should be no surprise that Zio’s makes one of my favorite pizzas in Omaha. How would you rate Zio’s Pizzeria? Click on the stars below! This entry was posted in Pizza and tagged Zio's Pizzeria. Bookmark the permalink. Hi, I’m a server at Zio’s. (writing of my own accord and not under direction of managment) Thanks for the good review. I have to admit, I’d prefer the floor TV to be placed somewhere else.. but having worked mostly in family-oriented establishments, I’ve dealt with worse. My remedy is to get dough and crayons to the table, ASAP, to keep the kids distracted and in a safer location.